IPTV offers the best possible way to distribute TV and video channels within a building, around an organisation, or across several different sites. By putting broadcast TV and your own audio-visual channels onto your IT computer network, Netvue IPTV lets you simply and easily show TV and video anywhere. You can add local video sources, such as DVD players or cameras, and have Video On Demand (VOD) programmes and your own TV channels streaming from your Video On Demand server. 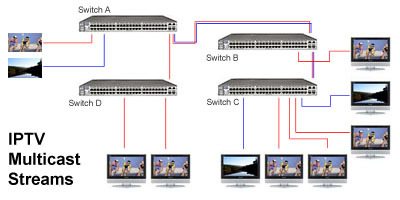 IPTV combines TV distribution technology with IT data infrastructure, and is based on TV and IT industry standards. 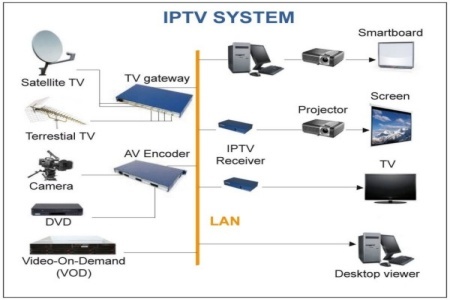 By using standard IT protocols to deliver video services, IPTV technology benefits from the continuous advances and improvements in IT technology. Click on the picture for a pdf Case Study on a Netvue IPTV installation. 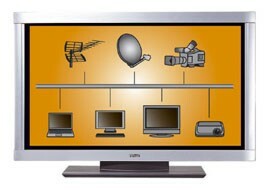 The IPTV channel streams are distributed ONLY to the destinations that request a channel, by using multicast protocols. Click here for a pdf document on Netvue IPTV technology. IPTV lets you stream TV and video channels within a building, around an organisation, or across several different sites. By putting broadcast TV and your own audio-visual channels onto your IT computer network, IPTV from Netvue lets you simply and easily show TV and video anywhere. IPTV uses the existing computer network - no new cables, no hassle! Click on the picture or here for a pdf document on Netvue IPTV technology.